Researchers at the University of Bath have developed a new type of sensor that is 100 times more sensitive than today’s sensors. The sensor is made up of a series of gold disk-shaped nanoparticles on a glass slide. 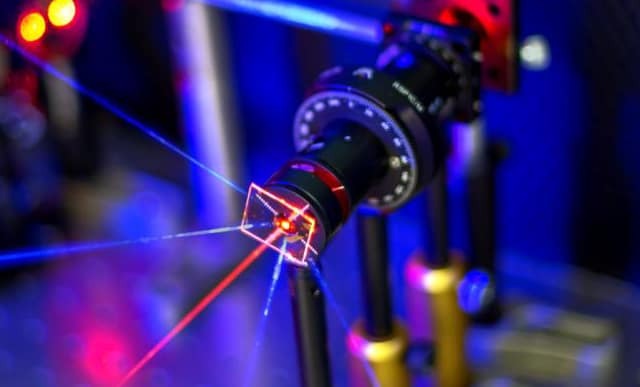 The team from the Department of Physics found that when they shone an infra-red laser at a precise arrangement of the particles, they started to emit unusual amounts of ultra violet (UV) light. This mechanism for generating UV light is affected by molecules binding to the surface of the nanoparticles, providing a means of sensing a very small amount of material. This could be used to develop new ultra-sensitive sensors for air pollution or for medical diagnostics. The nanoparticles were fabricated by US team members at Northwestern University in Illinois.